Fitting wooden decks in tiny yards might initially sound like a challenging task but it’s not. 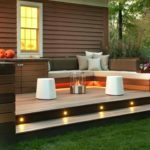 Similar outdoor wood structures will actually transform indifferent backyards into tiny oases and give you plenty of good reasons for spending more time under the stars. Let me make a brief pause here to point out that small backyard transformations are a hard feat. But that’s the reason why wood decks & pergolas will play a significant role in making this project so much easier. An outdoor decking will alone be a dominant structure in the backyard – let alone adding a pergola. This is a very powerful and striking combination. Let us consider small backyard improvements for a moment. The difficulty here is the limited space often further restricted by sloppy areas. Naturally, the small back decorating ideas are not plenty. If you are lucky, there is space to place a small dining table with chairs, a skinny swimming pool, or flower pots and benches. Now, what’s the role of wood pergolas and decks in this backyard metamorphosis? They offer solutions in one stroke. One of the common mistakes when trying to fix up a small garden is try to fit too many things in the tiny space to make it look good. Made of beautiful woods, decks and pergolas don’t need introductions or embellishments to transform spaces into impressive outdoor environments. The presence of natural wood alone will make a statement. One of the reasons why decks make excellent small garden remodeling ideas is that they can be customized. You have the freedom to design the custom deck to the scale of your yard. What’s important here? To measure the yard and assess your needs in order to keep the right proportions. Neither the deck nor the rest of the landscape should be overwhelming. All the same, its size must be comfortable enough for you to place the furniture you want. Align your outdoor deck with the indoor flooring. If there is a dark hardwood indoors, prefer an ipe deck for the yard. The eye will flow from indoors to the outdoors and vice versa without interruptions and this will create the impression that both your home and yard are bigger than they actually are. The idea is to create an ideal environment that will be charming, functional and comfortable. So avoid overcrowding the deck with furniture and decorating items that will only restrict traffic and pinpoint the small size of the yard. Prefer built-in benches around the deck’s perimeter that will create more space and make decking visually larger. 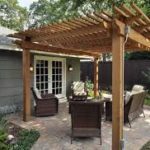 A custom pergola will add an extra layer of charm. It will complement the deck, provide shelter, and still allow you to breathe and find joy without getting dizzy from the sunlight or wet from the rain. After all, the pergola roof options are plenty. Another advantage is that pergolas can help you decorate easier. Since the space is small, you can hang greenery and flower pots from the beamed roof. You can secure deck lighting on the posts. You can throw fabrics to create a better shelter and let them hang on the sides as screens that will provide privacy too. If there is enough space for two-three levels of deck and the structure is elevated, create storage room underneath. Ask your deck builder if he can have one of the levels lifted so that you will store furniture or garden tools. Small backyard decorating ideas are not hard with decks and pergolas. Not only do they increase elegance but function too.